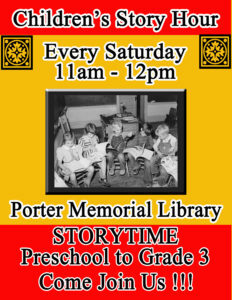 A story hour for kids led by Jillian Kirkland downstairs in our Children’s section from 11am -12 noon. Preschool to grade 3 welcome. Copyright © 2019 Porter Memorial Library. All rights reserved.